Research, flight safety, disaster relief, agriculture—all depend on timely, accurate weather measurements. Large environmental networks and small research stations alike need weather stations that can deliver dependable data. For many of these applications, full size data-collection stations are best, often essential. But there are many situations where factors such as size, cost, and ease of use send you looking for a different solution. All-in-one weather sensors are ideal to fill the gap, and now Campbell Scientific has introduced the ClimaVUE™ 50 to fill those needs in a more economical and low-power all-in-one sensor. 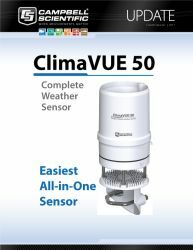 The ClimaVUE 50 gives you all the standard measurements you expect from a compact weather sensor (including solar radiation and precipitation), and is very easy to set up and use. It uses the SDI-12 digital protocol to communicate the accurate, reliable data you need. And it uses so little power that it can be used where many other stations cannot. Have you ever gotten bad data because a sensor or station fell out of level? The ClimaVUE 50 reports sensor tilt, giving you confidence that your data is accurate. The sensor is great for long-term deployment. No moving parts means minimal maintenance. The ClimaVUE 50 is completely field-swappable, with a connector at the sensor head and no action required in the data logger. The barometric pressure, relative humidity, and solar radiation sensors can be replaced in the field or at Campbell Scientific. The ClimaVUE 50 doesn’t compromise. Many all-in-one weather sensors trade accuracy, reliability, cost, or power consumption for size and convenience. 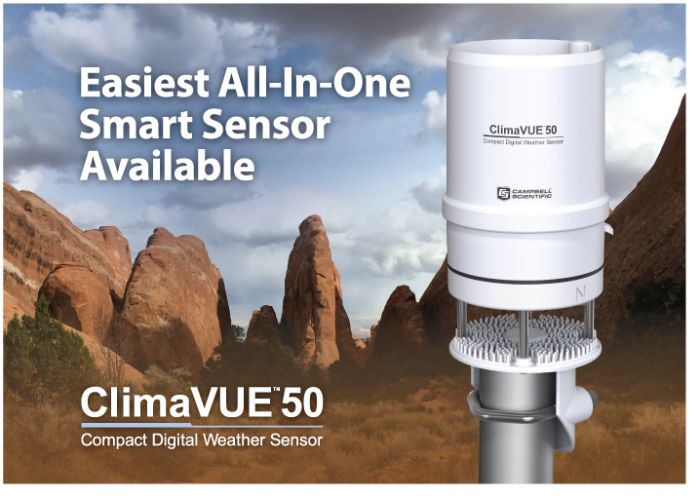 With the ClimaVUE 50 you can have quality data without giving up the quality and convenience of a reliable, low-power compact weather sensor. To learn more about the ClimaVUE 50, or to send questions to our highly trained technical and sales support team, please visit the ClimaVUE 50 product page. Also, read the recent blog article interview titled "No Compromise: Quality Weather Measurements and Simplicity."